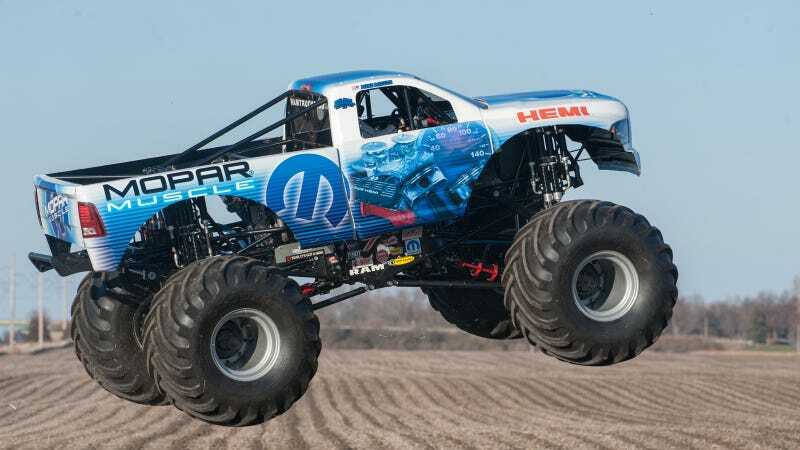 Monster Jam is a rip-roaring off-road spectacle unlike anything else in motorsports, and Chrysler has just announced they'll be joining the fray with a 2000 horsepower monster truck "based on" the 2014 Ram Heavy Duty. The 10,300 pound truck has a 565 cubic inch supercharged Gen II HEMI, which Chrysler's adamant to point out commemorates the engine's 50th anniversary. Apparently, this is the first entry by an OEM to the Monster Jam series in more than a decade. I guess the marketing metrics for pickups have shifted in favor of social media over building insane bus-jumping caricatures of their offerings. That's a damn shame, and I wish Mopar all the best in their efforts to buck the trend. I'll never forget the first radio commercial I ever heard for Monster Jam— "ten bucks buys you the whole seat, but you're only gonna need the edge" put wide-eyed excitement into my childhood mind, but my parents refused to take me. It was a feeble attempt to shelter me from mud slingin' off-road madness which, thankfully, ultimately failed. January 11 – Monster Jam in Detroit, Mich.
June 21-22 – 4 Wheel Jamboree in Springfield, Mo. July 11-13 – 4 Wheel Jamboree in Bloomsburg, Pa.
September 19-21 – 4 Wheel Jamboree in Indianapolis, Ind.